For transferring any files, PC users use TFTP server. TFTP is a file transferring protocol which is the short name of Trivial File Transferring Protocol. This is the basic tool for transferring files. TFTP server can be setup using Tftpd32 and Tftpd64. This tool is very easy to use and opensource. Obviously this tool is free to use. Just download it and use it. Here, I am going to show the entire process on how to download it and use it. Let’s do step by step. Step 2: Click on Download from the left-top corner. Step 3: Here you will be seen all the versions of Tftpd32 and Tftpd64. The latest version will be placed on the top. And this time it is v6.4 released on 6th February 2018. Click on the direct link for Tftpd64 installer. Step 4: A yes or no asking box will be seen, click on Yes. The tool will be installed in your PC withing moments. Step 1: Launch the Tftp64 software and click on Settings. Step 2: Unmark all the boxes without only TFTP Server under Global tab. Step 3: Then shift to the TFTP tab at the right. Then click on Browse to set up the Base directory. Select the folder (If you didn’t create still any, create it on your hard disk). All the files transferred by this tftp server will be stored in the folder. Then select None under the TFTP Security area. Then select the all the boxes which I have selected in the screenshot. Important note: When you mark the Bind TFTP to this address option, you have to choose the IP address also. For that, click on the dropdown arrow placed at the right. And choose any IP address from which are available. Step 4: Then click on OK. A pop-up window will ask you for restarting your computer. This time also click on OK. Step 5: After restarting you PC, lauch the program again and choose the same IP address. Wow! You have completed all the tasks perfectly. And your tftp server is ready for using to transfer files. If your want check the tool, copy a file to the base directory folder (You have created in the above) and to access the file type tftp://your tftp server ip. 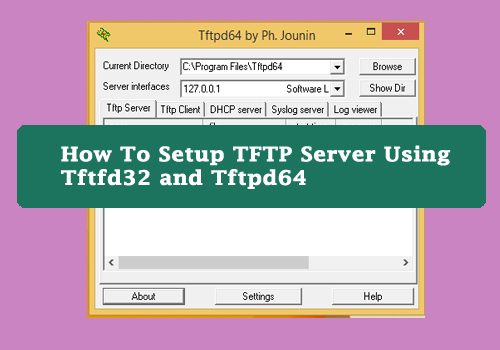 So, now I hope you have understood all the steps and you are able to setup tftp server on your PC using tftpd64. Here mind that, all the tasks are same in tftpd32 and tftpd64. If you like this article please share it on your Facebook and Twitter. Any feedback or question leave in the comment box please.